Auto-Accept Pending Orders that already Paid. Auto-Email client if Pending Orders are Unpaid. 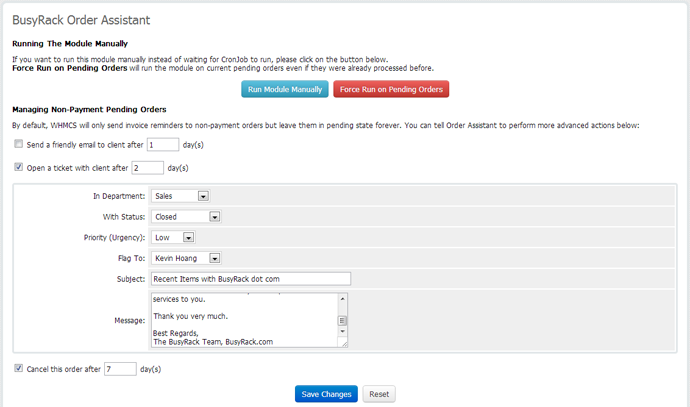 Auto-Open a ticket with clients if Pending Orders are Unpaid. Auto-Cancel Pending Orders if they are Unpaid for too long. Auto-Cancel Unpaid Invoices if they are overdue for too long. Addon is called once a day via WHMCS daily cronjob. Managing Non-Payment Pending Orders By default, WHMCS will only send invoice reminders to non-payment orders and leaves them in pending state forever. You can tell Order Assistant to perform more advanced actions. Accepting Paid but Pending Orders By default, even if you have auto activation enabled, then while the products and services in that order may be automatically provisioned and delivered to the customer, order status will remain pending until you manually confirm it. However, you can enable auto-accept this kind of orders for the selected products. Be the first to review WHMCS Order Assistant. Accept orders only when all items are Active. Send email report when CronJob is finished. Show report when Manual Run is performed. Add "History" tab to show actions performed in the past. Fix: send emails should work properly now. Change "send email" option unit from day to minute. Add option to select Product addons in auto-accept list.